Mango Ice Cream recipe by Afshan Nasir Alam at PakiRecipes.com. Make the custard as usual method with milk, sugar and custard powder, and let it cool. 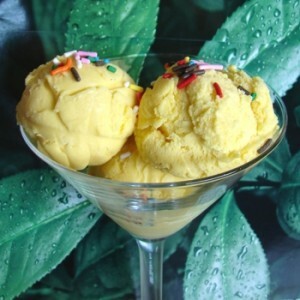 Peel the mango and cut into small pieces, and blend it with cold custard in blender, and then blend with fresh cream. If you have ice cream machine you can put it in ice cream machine, otherwise you can freeze it in freezer.